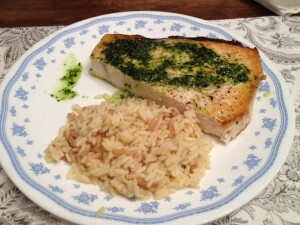 Swordfish is one of Steve’s favorite fishes, but I had yet to find a to-go recipe for it. I’ve experimented with glazes and marinades with varied results. Most recipes recommend grilling but that’s not an option for my apartment. I tried this recipe and thought this cooking method was great – heat oil in a oven friendly skillet, sear the fish for 3 minutes, flip and stick in a 400 degree oven till done. I let my fillet go for 8 minutes. I would use this method again and again. As for the sauce, I made parsley, garlic and lime butter to spoon on top and it was easy and flavorful.